The year 2000 came and went for Braille Stars. They saw their debut release, Golden Dream, hit the streets, and shortly after the duo went on hiatus, while guitarist/singer Gilly Ann Hanner went to school and drummer/singer Stef Darensbourg decided she didn't want to play live anymore. Though I was so overwhelmed with releases to cover and couldn't get around to reviewing this album until now, Golden Street was one of the best albums of 2000 and highly overlooked by both the media and consumers alike, mainly in part to the band's untimely hiatus. 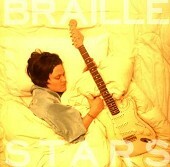 However, with a new drummer and a renewed passion for the band, the Braille Stars are back, working to promote Golden Dream. A collection of beauty and precision, the eleven songs on Golden Dream are spectacular, ranging in sound from poppy to drone-y, loud and bombastic to soft and pretty, all the way to raging and smooth. Hanner's voice is as majestic as they come, strengthening the pretty melodies the instrumentation creates and adding a whole new melody line. The music is fierce, even when it is soft, using plenty of guitar and drums, among other things, to overwhelm your senses and ensure you fall prey to the sound that is Braille Stars. Even though the record never got a fair shake around its release, its time has come. For what it's worth, I consider Golden Dream to be one of the best records of 2001, even though it was officially released in 2000. Soothing, smoldering, loud, gigantic, and charged, here is music that embraces whatever it wants and does a good job at doing so. I'll give it an A+.